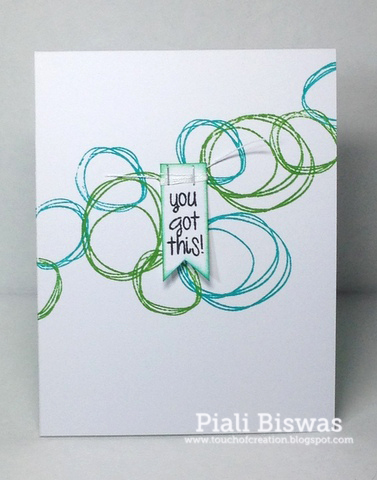 Today, I'm sharing a fun technique over at CardMaker Blog. 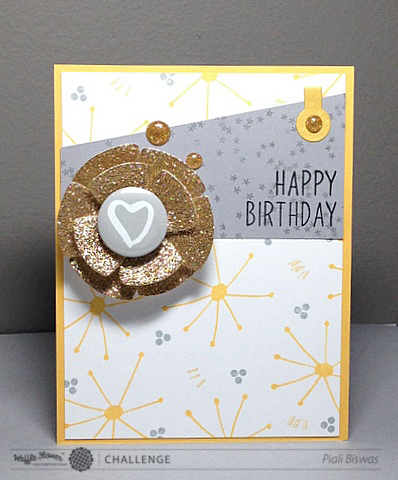 CardMaker-The Stamps of Life blog hop!!! 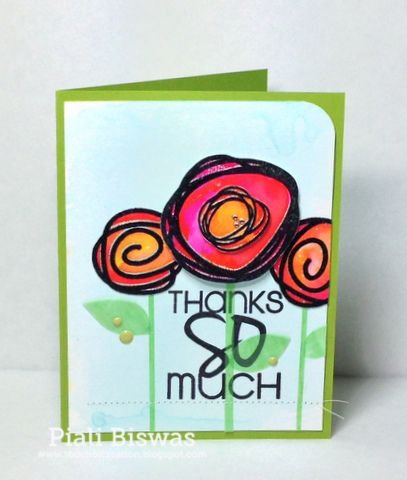 Welcome to CardMaker- The Stamps of Life Bloghop!! Today, we're creating with The Stamps Of Life team for this special hop. 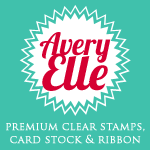 If you are new to The Stamps of Life products...please check them out HERE. 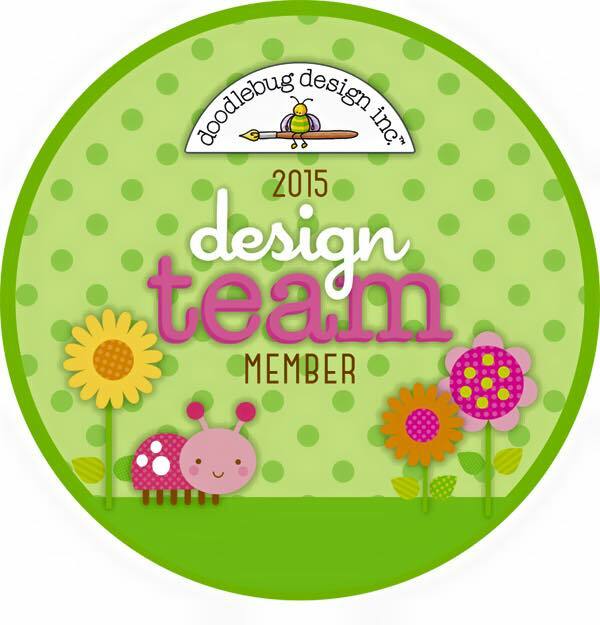 I'm sure you will like the gorgeous stamps and dies collection!!! For the first card I used watercolors with the Scribbles2stamp set . Those sketchy circles look great as flowers. I heat embossed them on watercolor paper and then colored them with Distress inks. I loooove how turned out!!! The sentiment is from Phrases2say set. Just added few vellum stems and leaves for a fun look. I heat embossed the background and sponged distress inks. I used silhouette cut file to cut the circular sentiment panel. The sentiment is again from the Phrases2say set...this set is full of great sentiments!!! Inside sentiment is from Scribbles2stamp set. Simon Says Stamp - Embossing. 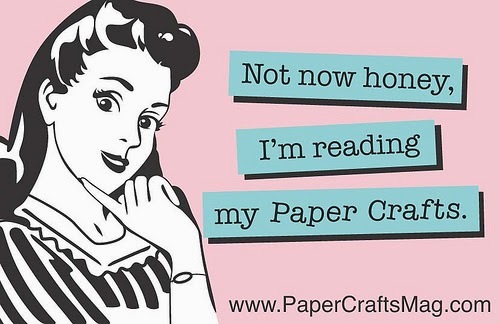 That Craft Place -Anything Goes. Hope you all like my cards! I had a blast creating with The Stamps of life stamps!!! I'm sure you will see me using these sets a lot in future. The Stamps of Life have a giveaway of three stamp sets ($12.95 value or less) on their Blog. Make sure to hop along and leave a comment for your chance to win!!! Here is a CAS card using this stamp. I colored the image with Copics. Applied some glossy accents to the eyes and the bubbles. Simon Says Stamp - Spots and Dots. That Craft Place - Anything Goes. Great Impressions - Animal Friends. I added few new stuff to the destash Craft sale page...check it out HERE. Waffle Flower Challenge -Take 2!!! Today I'm sharing my 2nd take on Waffle Flower Challenge#1. Did you play yet??? No worries...you can still join us and share your creation. Check HERE for the prizes details. I used Flower Circles Stamp Set to create the random background pattern. I made the gorgeous gold flower using the Bowtiful Die Set. I learned the technique from Nina. You can find the video tutorial ...HERE. I used the stars and sentiment from Bowtiful Stamp Set . I also used the Surface Tag die Starter kit to create the yellow element on the top right. The flair is from Amy Tangerine -Plus One collection. Stamping Sensations - Summer blooms. Hop over to Waffle Flower Blog for more inspirations. 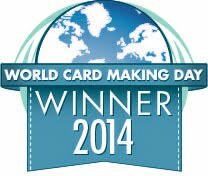 Today I've my first post over at CARDMAKER Magazine Blog. I'm sharing photos of my Creative Space. As you all know we just moved so I've temporary Crafty corner now. 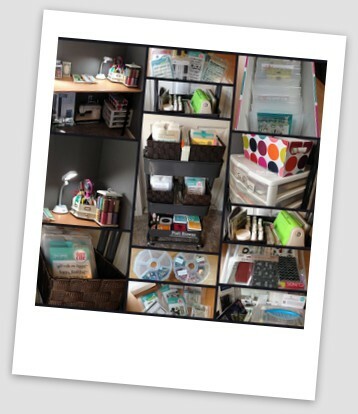 I would love to have all of you over at CardMaker Blog to see my little crafty nook. Leave me a comment there, if you stop by. Hope all my US friends had a wonderful 4th of July!! We had a great one!!! Today I'm here to share a card for few FAB challenges..
Virginia's View - Die cutting Challenge. 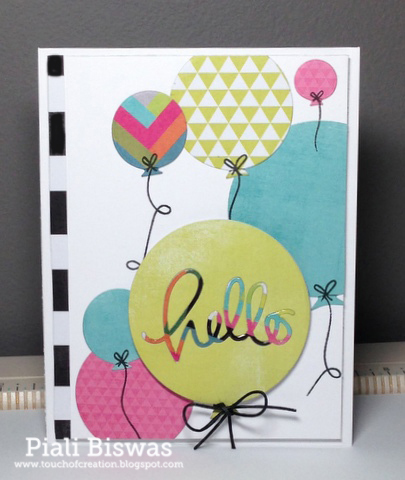 I used Avery Elle Balloon dies and Simon Says Stamps Small hello dies! Love AE Ballon die set comes with a wide variety sizes of balloon and the SSS small hello die fits perfect in the largest balloon die. The beautiful DPs are from Heidi Swapp. I used string stamps from Avery Elle-Balloon stamp set. Balloon Dies are very common nowadays , I see a lot of balloon cards around blogland...so thought this would be fun "hello" card, what do you think?? ?